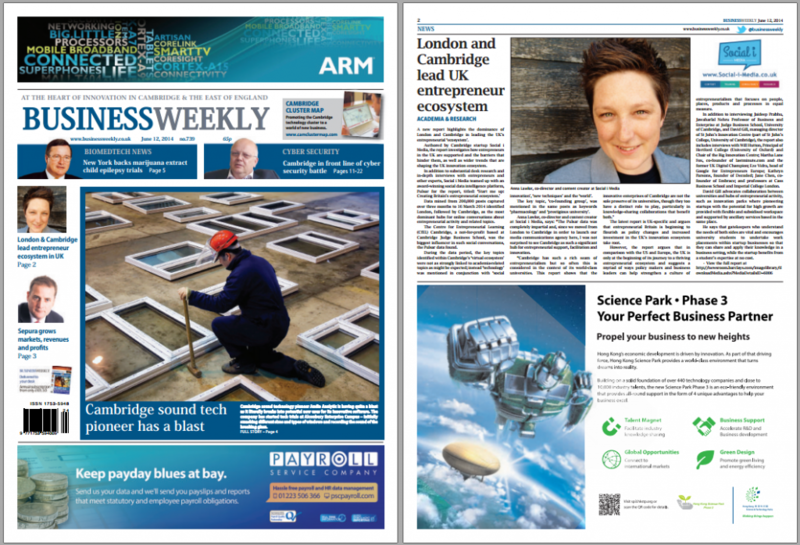 Luminescence was quoted in Business Weekly, the leading B2B publishing source for East of England’s tech and innovation scene. A report authored by Anna Lawlor, co-founder of Luminescence, found that Cambridge and London were leading the UK’s innovation ecosystem. The report, produced for Barclays and The Economist – ‘Start me up: Creating Britain’s entrepreneurial ecosystem’ – investigates how entrepreneurs in the UK are supported and the barriers that hinder them, as well as wider trends that are shaping the UK innovation ecosystem. In addition to substantial desk research and in-depth interviews with entrepreneurs and other experts, Luminescence teamed up with an award-winning social data intelligence platform, Pulsar. Data mined from 200,000 posts captured over three months to 16 March 2014 identified London, followed by Cambridge, as the most dominant hubs for online conversations about entrepreneurial activity and related topics. “The Pulsar data was completely impartial and, since we moved from London to Cambridge in order to launch our media communications agency here, I was not surprised to see Cambridge as such a significant hub for entrepreneurial support, facilitation and innovation. The Centre for Entrepreneurial Learning (CfEL) Cambridge, a not-for-profit based at Cambridge Judge Business School, was the biggest influencer in such social conversations, the Pulsar data found. During the data period, the key topics identified within Cambridge’s ‘virtual ecosystem’ were not as strongly linked to academia-related topics as might be expected; instead ‘technology’ was mentioned in conjunction with ‘social innovation’, ‘new techniques’ and the ‘world’. The key topic, ‘co-founding group’, was mentioned in the same posts as keywords ‘pharmacology’ and ‘prestigious university’. Top tweets during the period featured ‘hot Cambridge shares’ and content about the Cambridge Satchel Company expanding into China. In January, Anna Lawlor of Luminescence authored a global report – ‘Innovation ecosystems: Empowering entrepreneurs and powering economies‘ – for the Economist Intelligence Unit, on behalf of Barclays, which presented the report at the World Economic Forum in Davos. That report argued that global economies are on the cusp of a “third-wave industrial revolution” in which enterprising, young innovators will play a central role, and says that the rise of “micro-multinationals”— start-ups which operate across high- and low-cost locations, delivering to an international customer base — exemplifies the opportunities offered by globalisation, digital communications and the Internet. *Published under our previous brand name. Read about the name change and new identity here.